Enjoy a quiet, beautiful short walk uphill to a secluded and breath taking view of the Las Vegas Strip. 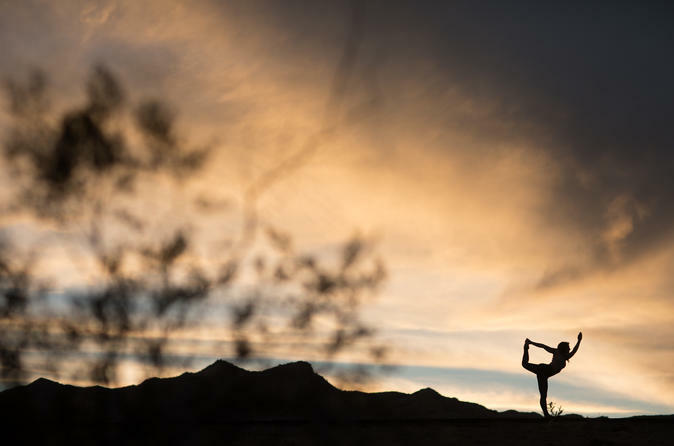 Watch the Las Vegas Strip light up during sunset while practicing yoga. This private yoga sessions will provide the freedom from day-to-day distractions and allow you to immerse yourself in a breathtaking locale. Each yoga session will be tailored to the individual and/or group in order to ensure the proper tone and intention is set. This is an all-inclusive experience. Guided walking tour, customized yoga session, yoga mats and water will be provided. The journey will begin at a public local park in Las Vegas. Your instructor will provide each guest with a yoga mat and bottle of water. You'll then be guided on a short walking tour, approximately 15-20 minutes, to the top of an overlook of the Las Vegas Strip. While the sun sets, you'll go through a yoga practice as the Las Vegas Strip lights up. All ages and levels are welcome. After a silent relaxation period, you'll be led back down from the overlook to the original meeting place.